Photo credit: m01229, CC BY 2.0. I grew up in the Midwest and Southwest U.S., in the suburbs where we were thrilled when a Target opened within walking distance — before that, the 7-11 was the most interesting place that my siblings and I could get to without a car. Subways, metros, even viable bus lines were things I associated with exciting places that I got to visit very rarely, like New York and London. When I moved to Washington, DC in June of 2009, its metro system represented to me both freedom (I do not drive) and an ideal: transportation as a public good that makes communities more livable and accessible. 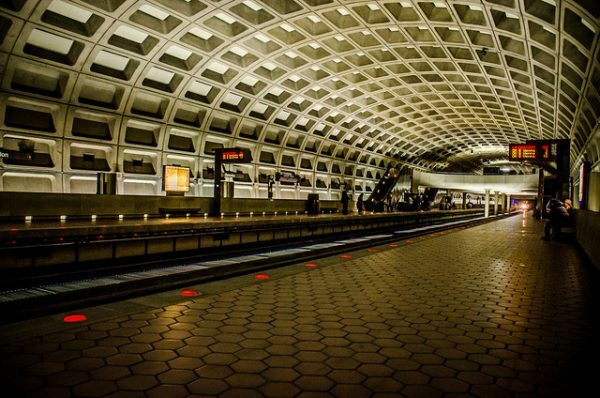 A few weeks later, DC Metro suffered the greatest crash in its history. In addition to the tragic loss of life, this also marked the beginning of a long downhill slide for the transit authority and a slow falling out of love with public transportation for me. At the time, though, I remained a staunch defender of the system, and continued to idolize it. After all, car travel is still more dangerous, and I reveled in the ability to build a car-free life. I lived in Silver Spring, and worked one job in Adams Morgan and one in what would come to be NoMa (at the time, I just thought of it as slightly north of Union Station). For those not familiar with DC Metro, I lived on the Red Line, which is shaped like a U. Unfortunately, I lived at the upper end of one part of the U and one of my jobs was near the upper end of the other half — which turned an otherwise short distance into a long loop. About a year into this arrangement, my Adams Morgan job became my full-time job, and the commute became increasingly untenable. In order to arrive on time for work, I had to leave a 45-minute buffer, since trains would often single track, offload unexpectedly, or just sit for ages. I could read during the commutes, which was nice, but spending so much time getting from place to place meant I had little life outside of work. I tried buses a few times, and found them even less reliable. Sometimes the bus would just never show up; other times it would stop mid-route for 30-40 minutes to change drivers; even if everything went well, the bus would always get stuck in traffic. I worked Tuesdays through Saturdays at this time, since my job involved supervising a crisis hotline. The final moment that did it for me was the Saturday of Jon Stewart and Stephen Colbert’s Rally to Restore Sanity; I was trying to get home from a particularly grueling and brutal shift, and I found myself offloaded due to overcrowding on an outdoor platform in the DC heat with hundreds of rowdy ralliers. The situation felt incredibly unsafe, since we were overcrowding the platform as well, edging close to the ledge down to the tracks. As I stood on the platform silently hating Stewart and Colbert (though if I hadn’t had work, I probably would have gone to the rally), I vowed to myself: never again. Running the numbers on my commute made me realize that moving from a group home in Silver Spring where I paid $650 a month (plus utilities) for a small room to a $1,000 studio in Adams Morgan would be almost cost-neutral. I was paying nearly $300 a month to ride metro during peak times, and as an NGO worker I didn’t have any employer subsidies (many DC workers do). Moving to a place where I could walk to work did amazing things for my quality of life, and metro and buses became my routes to social activities and hobbies only. For several years, this was largely sustainable. Eventually my office moved downtown, but I moved as well and maintained a 10-minute walk to work. Metro still remained a source of stress, though; I never knew if I could make it to weekday evening activities on time (I am the kind of person who gets anxious if I’m late for things), and getting home from anything after 9 p.m. was painful since trains ran so sporadically that the scheduled wait was often 30 minutes — and that’s if the next train arrived on time. My car-owning boyfriend (now husband) moved in with me; the apartment has no parking or even right to street parking, so at first we tried keeping the car at his work. Eventually we started leasing a parking spot for around $250-275 a month (we’ve had to change spots a few times as the people we leased from either moved or bought their own cars). Because of this, I’ve stopped taking the metro almost completely. Even with traffic, it’s easier and far more pleasant to get around by car. I still relish the walkability of my neighborhood, but I’m in a car almost every day now at some point; it used to be that I would go months without getting in a car, to the point that they would feel incredibly strange when I’d go visit my parents and we would drive everywhere. I’ve even started taking Uber and Lyft when our car isn’t available or when parking would be too much of a hassle, and it’s not much more expensive than DC Metro would be in most cases. Meanwhile, the metro system itself continues to deteriorate, as it faces budget woes, fleeing ridership, increased safety concerns, and the need to do massive structural repairs that were put off for decades. This summer, DC Metro told riders to only use it if they have no other option; there’s also a website called Is Metro On Fire? which is comical in a dark way, but also sadly relevant — many days, the answer is “yes.” As ride-hailing apps gain popularity, traffic becomes noticeably more congested. I know that by opting out of public transit, I am contributing to these problems. I’m part of the lost revenue that makes it hard for the system to maintain service, creating a vicious cycle. By having a car and taking rideshares, I am contributing to the traffic problems and environmental unsustainability. Living in this tragedy of the commons, I recognize the privilege I have that lets me make these choices, and I know that the reason these choices make economical sense for me is that this country subsidizes cars and gas more than it supports public transit. At the same time, I have come to recognize that a public transit system that fails to meet needs for reliable, safe, and cost-effective transportation will not be sustainable. My love of public transportation as an ideal isn’t enough to sustain me through weekend single-tracking month after month, and the choices I’ve made over the years make it less and less economically sensible to opt back in. Jennifer works in data and human rights. She lives in Washington, DC with her husband and their rabbit.